Come on, when you push aside years of cognitive distortion build-up and trodden self-worth, you still want to believe there isn’t even one precious jewel within? Last time, I shared a day-excursion to my alma mater, the necessity of which came on suddenly, out of nowhere. In “‘Forty-three years ago,’ I kept saying to myself: A valuable lesson on living life,” I detailed a time of pondering and processing that banged home a lesson on the importance of truly living life. And it raised some existential concerns, as well. So go figure, off I went on another trek this past weekend. Once again, a great message hit home. And, once again, I’d like to share. Oh, I get it. Detroit’s history of – and present – monumental challenges have earned a place on the national stage. And even though it’s on the comeback trail, one can easily make the wrong turn and find themselves in the midst of poverty, decay, sadness, suffering – and danger. Hmmm, isn’t safety at the very core of so many of our personal challenges? And that sticks even if we live in the most secure hamlet. Okay, okay – to the point, right? 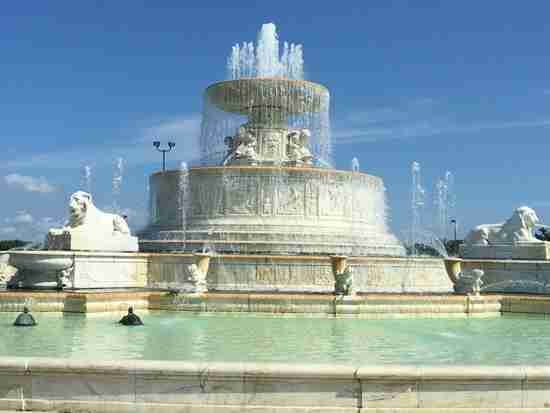 Just minutes from some of Detroit’s most dangerous neighborhoods is one of its precious jewels. Belle Isle is a 1,000 acre island located in the Detroit River between the U.S. and Canada, just a few miles from center-city. It’s a wonderful place. Check-out the 90-year-old James Scott Memorial Fountain in our featured image above. And to the left is the same-aged William Livingstone Lighthouse. 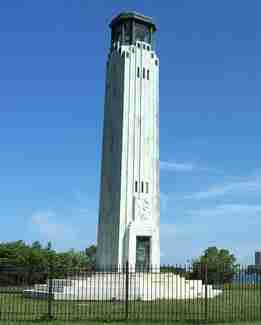 Designed by Albert Kahn, it’s the only marble lighthouse in the U.S. Just imagine the comfort and safety it provided Great Lakes freighters making their way from Lake Huron through St. Clair to Erie. Now, up until two years ago Belle Isle had lost much of its luster, as decay and danger consumed it. But then the City of Detroit declared bankruptcy. And not long after, the State of Michigan leased Belle Isle from the city and made it a state park. Boom! Belle Isle came back to life, beauty and safety returning. Precious jewels exist within even the most undesirable environments. And safety can absolutely return, and remain, in spite of a history of danger and treachery. Isn’t that the way it is with us? Our brows burn and drip with the fever of our emotional/mental misery. And the wallop on our self-worth is so hard to absorb – time and time again. How we long for soothing. Well, that soothing is there for us at anytime. And what better mental focusing device to put it into motion than a precious jewel within? I don’t know, maybe you don’t believe you have one. Oh, I suppose I can understand why you might think that. However, is it realistic? Come on, when you push aside years of cognitive distortion build-up and trodden self-worth, you still want to believe there isn’t even one precious jewel within? As an objective, non-judgmental soul who doesn’t know you from Adam or Eve, I refuse to accept that. As a matter of fact, I challenge you to sit-down with pencil and paper and come up with at least one precious jewel you hold within. Will you do that? And maybe share the experience in a comment? More importantly, will you begin to put that precious jewel to work in helping you soothe that fevered brow of yours? So, it was a great day at Belle Isle – just one of the precious jewels within a rough, and healing, neck of the woods.